Random Noodling: Poetry Friday--''Four Ducks on a Pond"
Poetry Friday--''Four Ducks on a Pond"
Spring is here, although on Tuesday we had a little hail, a little rain, a little cold, a little sun, and we ended up with a rainbow. I suppose you have to expect it ALL in the spring! Most New Englanders seem to favor autumn as their favorite season. Personally, I hate the fall--too damn depressing. Spring is my hands-down favorite. However, it is not without its melancholy aspects, too. Here's a simple little poem, often used with children, that expresses both the joy and the melancholy inherent in spring. Paddle over to My Juicy Little Universe for the Round-Up this week. 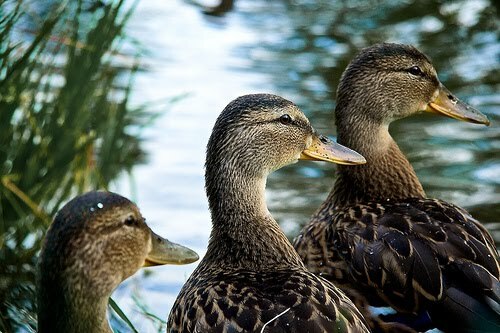 Photo of three ducks on a pond (I'm sure there's another just out of the frame) by Marius Waldal.